Nuclear energy has always struck me as a bad idea. The idea that you can simply bury radioactive waste in ground and forget about it (I once heard an MIT professor make this very argument) has always struck as naive. This stuff remains radioactive for one hundred thousand years. We have no idea what the world will look like in one hundred thousand years. 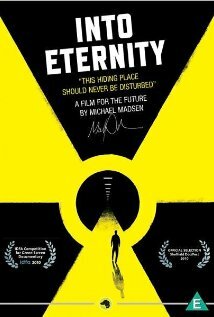 In his documentary, Into Eternity, Michael Madsen investigates the construction of the Onkalo nuclear repository in Finland. (Onkalo means “hiding place” in Finnish.) It is a massive underground tunnel blasted out of granite bedrock. It will be used to store radioactive waste from nuclear plants. It will be closed off after one hundred years, sealed forever (one hopes). The film is filled with interviews with scientists and engineers working on the project, as well as with the man responsible for detonating the explosives that carve the tunnel out of solid rock (I must say, he is poetic in his observations). They all come across as intelligent and well-intentioned. They discuss the problem of trying to deter people in the future from disturbing the tunnel and its contents. The idea of putting up warning markers, in all the world’s major languages, is the preferred solution. Someone suggests putting up ominous jagged sculptures to frighten people away. Someone else actually suggests that they should simply “forget” about the structure after its done, though this idea is (wisely, I think) rejected. There are lingering shots of the inside of the tunnel. There is something eerily beautiful about the place, especially since one knows that it will eventually be sealed from human sight forever. When Madsen asks an engineer if perhaps nuclear energy is more trouble than it’s worth, the latter replies that it is better than global warming. This assumes that our only choice is between nuclear and coal. Madsen doesn’t make the argument that what we need to do is develop renewable energy sources. This would be a far better plan than riddling the Earth’s surface with radioactive tunnels. This entry was posted on April 25, 2011 at 7:40 am and is filed under Cinema, Environment. You can follow any responses to this entry through the RSS 2.0 feed. You can leave a response, or trackback from your own site.